Bangor, ME. Editor: G.W. Brown, editor and proprietor. 1/1, February 1858-1860(?) 8 pp., $1.50 a year. Noted in Spiritual Telegraph, February 25, 1860, as having been begun in 1858. 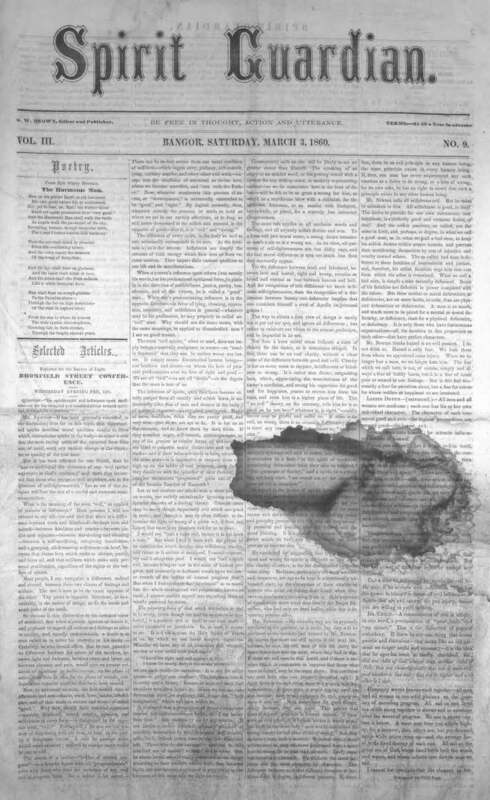 The Banner of Light, July 9, 1859, notes the journal's re-appearance after a seven-week suspension, replete with new type, and says that "it is devoted to freedom, individual sovereignty, and general intelligence. It is a good family newspaper, sustaining manfully the beautiful truths of Spiritualism." The Radical Spiritualist in March 1860 says that "it seems to be a fair and discriminating sheet, often leading too far into the quagmires of radicalism, and containing more specifically spiritualistic matter than can be found in the Radical." The journal carried reports on the appearances of Lizzie Doten and messages from Hosea Ballou, and interminable discussion of "Spiritualism and Slavery." On this last subject its readers ranged from those who urged it to have "nothing about Slavery . . . or any thing unless it has a Ghost in it," to Brown's own position to avoid disunion and war, to the views of those "fanatical, and fire-eating Abolitionists of the North, who are doing the work of dissolution far more than the slave holder, and if the Union of these States ever be dissolved by this much abused slavery question, it must be placed to the credit of Northern office-seekers and wire pullers, who care more for the spoils and emoluments of office for the freedom of the slave or the good of the country." University of Rochester.